What a beautiful Shabbat today at Magen David Synagogue celebrating the 70th Birthday of the State of Israel. Prayers, blessings, song, waving flags, and a lovely Kiddish feast following services. Immediately after the genocidal Holocaust that exterminated six million Jews - 1 out of every 3 in the entire world - the modern State of Israel was founded in 1948. With thriving cities, arts and culture, flourishing farming, science and innovation, Holy religious sites, a rich history everywhere, and a formidable military. There is so much to be proud of and to thank G-d for. Oh G-d, we praise you in that you have returned your children to Zion as you promised from Biblical times and breathed fresh life into their dry bones. Only you can revive an entire people and a land. Only you can create a blooming Garden of Eden from barren desert. Throughout 2,000 years of exile, we remembered your promise and we prayed for redemption, and you showered your gracious mercy on us and brought us back on wings of eagles. For 70 years now, nations have risen up against Israel to try to destroy it, but only you have saved it through the brave arms of the Israeli Defense Forces (IDF). Praise to G-d Almighty. Praise be to G-d in Heaven and on Earth. Praise be the creator and sustainer. We honor you through keeping your Holy Torah commandments and remembering that you Hashem, are our G-d and you are One. It is our job to live a life of integrity, to do good whatever we do and wherever we go, as your children and as a light along with America unto the other nations. As we sang in the Holocaust, "I believe with a full faith in the coming of the Messiah, and thou he tarries, I will never-the-less wait." The waiting was over 70-years ago, and we are living in the age of redemption. Miracles abound and the world progresses scientifically and technologically and with a spirit of doing good and justice. The nation of Israel lives! 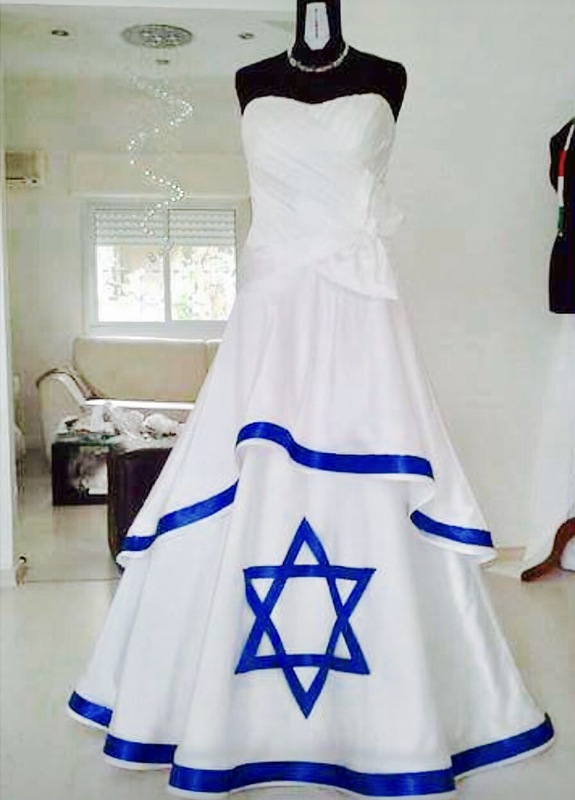 Someone shared this beautiful Jewish wedding gown on Facebook and I wanted to share it with you, because it represents life, love, and faith. I thought that in light of the report that came out of 917 hate groups operating right now in the United States, that I would take this as an opportunity to be me. To hell with all the haters out there! - The more they hate us, the more I will love my Jewishness. - The more they try to stamp out our religious freedom, the more I will relish in it. - The more they try to kill us, the more I will live as a Jew. So while we were in Florida, we went into one of the many art galleries. 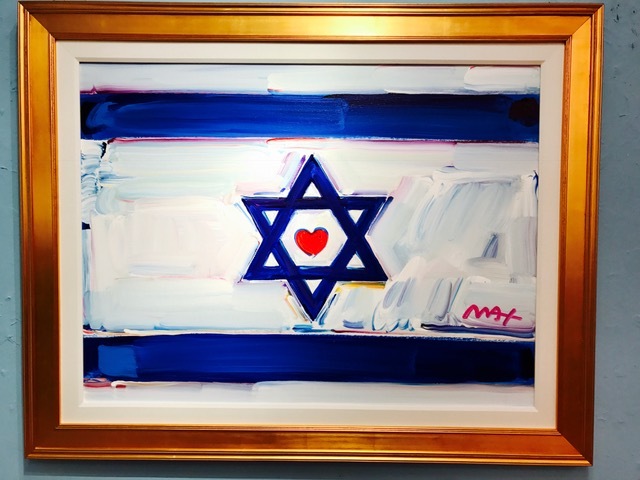 And on the wall was this painting of the Israeli Flag with the Star of David and inside was a beautiful red heart. Out of curiosity, I inquired how much this was and the lady says, "Oh, that is $55,000!" 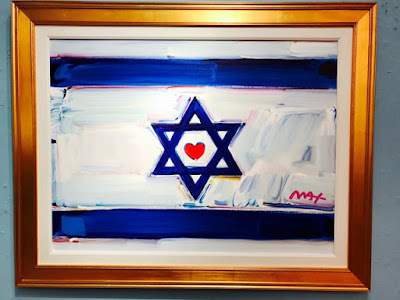 While we were impressed with the painting of the Israeli flag and what it represents as one of America's greatest allies and friends, we must've looked really puzzled at the price, because the lady goes, "Well, of course it's worth it! It's by Peter Max, the most famous artist in the world." My wife and I nodded and left the store, and immediately were asking each other why every gallery says with a straight face that the artist that they represent is the "most famous in the world." Anyway, at the same time this was going on we were following in the news about the controversy with people burning the American flag and the question of whether this is just an expression of free speech or something more that should be prohibited as disrespectful and unpatriotic or even traitorous to the country. There over 200 land disputes around the globe, but on Wednesday, the European Union singled out the one Jewish State of Israel and targeted them over the dispute with the Palestinians. The EU insists that goods produced in Israel--on land seized from Egypt, Jordan, and Syria in The Third Arab-Israeli War of 1967--be labeled as "Made In Settlements"--thereby supporting the anti-Semitic movement of Boycott, Divest and Sanction (BDS) against the democratic State of Israel. Just two days later, the EU got their sincere thank you from extremist Islamic terrorists who mercilessly struck Paris with attacks at the concerts halls, restaurants, and sports stadiums brutally killing at least 129 people and wounding over 350 others. All loss of life is terrible, and especially innocent victims of terror, and my heart goes out to the victims of these evil attacks in Paris. Unfortunately, Europe is getting just a taste of what Israel has been living with for 67 years surrounded by hordes of violent extremists willing to inculcate generational hatred and wage unending terror and war--from missiles and suicide bombs, rocks and molotov cocktails, guns and knives to BDS, they are more than happy to use whatever it takes to kill all Jews and Zionists and throw every last one into the sea. So perhaps Europe may finally awake from its deep slumber and long Anti-Semitic history, and instead of targeting Israel with BDS just 70 years after the Holocaust where six million Jews were murdered in Europe, the EU will recognize who is attacking them and is the true enemy of western civilization, democracy, and their very national identities. High time for Europe to embrace Israel as their brothers in faith and allies in the battle against terrorism, hate, and extremism. BDS is just another terror tactic by the extremists who want to terrorize and murder Jews and other "infidels." And labeling products from Israel like labeling Jews in the Holocaust with the Star of David is anti-Semitism and evil. The Magen David is the Star or Shield of David. It is the symbol of the Jewish people and of Israel (it is center on the Israeli Flag, the Degel Yisrael), and dates back at least a 1,000 years. Magen David Sephardic Congregation is also the name of our wonderful new synagogue in Maryland. As the amazing picture above shows, the Magen David actually can represent every single letter (24) of the Hebrew alphabet. 1) INCLUSIVE -- As every Hebrew letter is found in the Star of David, so too the synagogue is a place where every Jew, no matter Ashkenaz or Sephardic, Chasidim or Misnagdim, Orthodox, Conservative, or Reform--everyone is welcome and part of the greater family and community. The synagogue is a place we go to connect with our fellow Jews, where we respect and care for each other--our brothers and sisters, and where we Kibitz, laugh, and share of our selves and our heritage together. 2) HOLY -- The Magen David is holy as the religious symbol of the Jewish people and representing all the hebrew letters as in the Torah and the Ten Commandments. 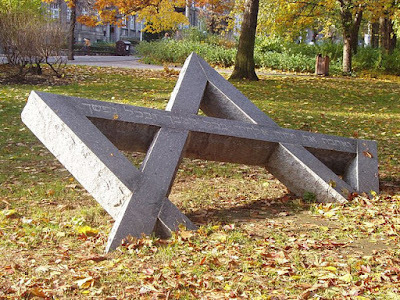 Some also believe in a Kabbalistic or mystical symbolism to the points of the star. Similarly, the synagogue is a place of holiness, and the Mikdash Me'at or small Temple (until the Holy Temple is rebuilt on the Temple Mount in Jerusalem). It is the place we go to sacrifice to G-d and a central place where we can do good deeds for our fellow man. 3) PRAYER AND LEARNING -- The Magen David represents the Jewish people, who are known as a people of the book. 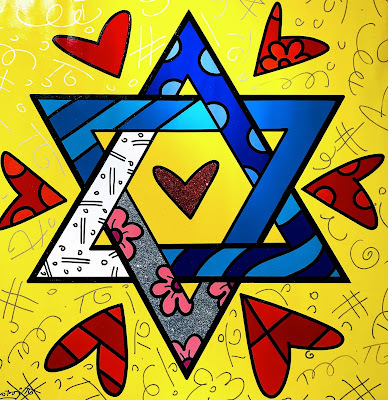 And the Magen David with all the Hebrew letters can represent all the Bible, prayer book, and wisdom of our sages. Prayer and learning is central to our faith and service to G-d. Similarly, the synagogue (and Yeshiva or Jewish school) is the center of our religion where we go daily and on Shabbat and holidays to Pray and learn Torah. So not sure this is the most respectful place to put a Star of David. But with the traditional colors--white and blue--of the flag of Israel, I think I see the effect they were trying to get here. Also, notice the blue and white rims of the wheels and handlebars. Labels: Bicycle, Cool, Creativity, Design, Flag, Israel, Jewish, Photo, Star of David, Washington D.C.
Peace comes in many shapes and sizes--peace talks, peace negotiations, peace treaties, and now even peace trucks. Reminiscent of the peace marches and brightly painted VW peace vans of the 1970's, The Washington Post (26 January 2013) reports on a 76-year old retired Energy Department staffer with a PhD in mechanical engineering who for his second career is starting a peace food truck in DC. The food truck will have two windows for selling kosher food from one and for selling halal food from the other. The owner-activist who is an Egyptian American hopes that "it will bring people from different backgrounds, who are waiting on line, to talk together." 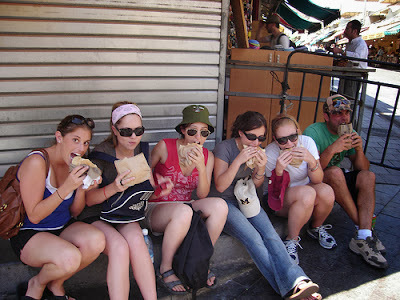 He says: "I think it will work because, well, everyone likes food," and he hopes to fund additional food trucks in Chicago, New York, Israel, and the West Bank. The truck has both the Jewish Star of David and Islamic Crescent painted on it--it is truly a truck for representing diversity of people, but with a common taste in good Mediterranean food. 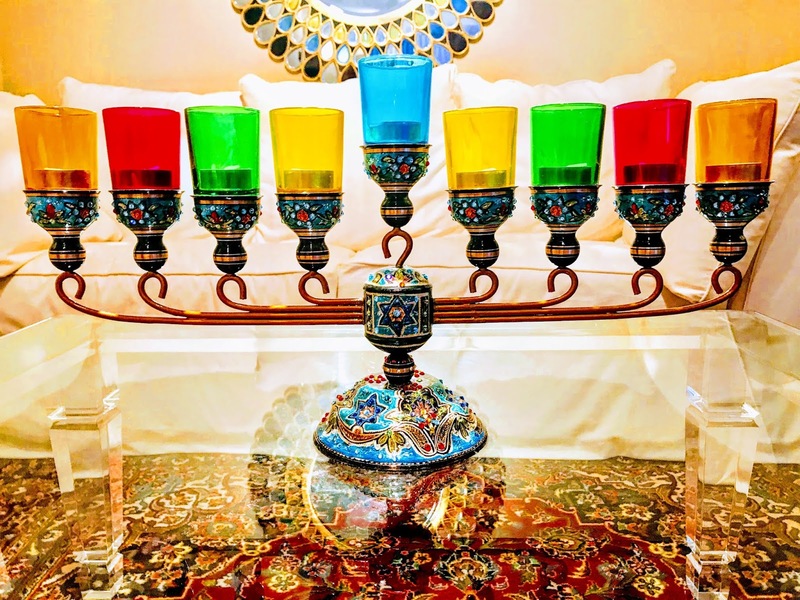 On the third night of Chanukah, my true love gave to me...nah. So wanted to share this nice pair of menorah Chanukah socks. Unfortunately, my daughter took a picture of them, but didn't bring them home for me.